Friendship Fields is a program associated with Friends University that allows college-age adults with disabilities to experience college life while also offering Friends University students the opportunity to work with special needs students. Students enroll in Friendship Fields because they want to go to college and Friends University truly believes lifelong learning and social interaction is important for everyone. This program is designed for high-functioning special need adults and will feature a curriculum that has been mapped out for four years. The students will study such topics as first aid, nutrition, interpersonal skills, vocational skills and much more. Students may have the opportunity to have work-study experiences with various University departments. Students participate on Tuesdays and Thursdays during the school year and follow a curriculum that focuses on life skills, people skills and social interaction with college students. Dr. John Taylor teaches about music with Dr. Hetherington in vocal music and Karen Scroggins teaches art. Friendship Fields students also regularly interact with other Friends University student volunteers, including many of the athletic teams. College-type activities include visiting practices and athletic games, hanging out and playing games with student athletes, having dinner in the student dining hall with Friends students and attending an occasional school dance, among many others. 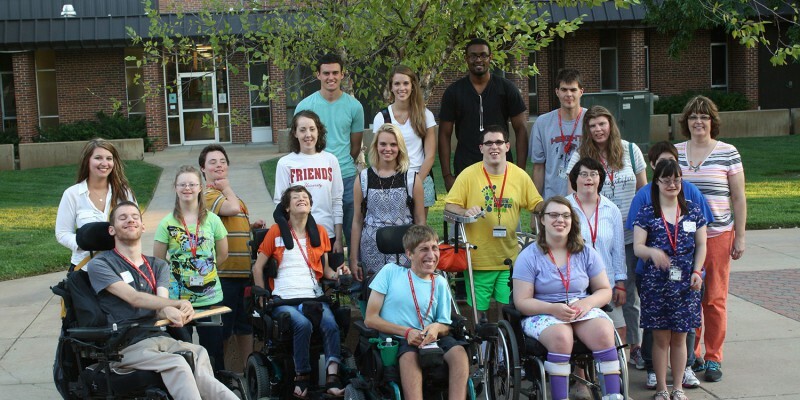 The Friendship Fields program is not only helping special needs students with their desire to experience college life; it is transforming Friends University students’ lives. For more information on Friendship Fields, please contact Friendship Fields Director Valerie Wall at wall@friends.edu or 316-619-9633. Please view the Friendship Fields Newsletter created by Friends University alumna, Rosemary Miller – March 2016. You can also view the April 2017 newsletter.